You don’t have to run to come and meet fellow Trail Hawks! Lawrence Trail Hawks, Trail Hawk friends and family are welcome at this yearly fun run and get together! There is no fee to run, but we will be accepting donations at the shelter. The Place: Gather at 6:00 at Shelter One, Corps of Engineers Overlook Park, Clinton Lake State Park. (In the case some other group beats me there, we’ll be at shelter 2.) Party will be over by 10 pm. The Race: Packs will be sorted as you arrive. Check in with Kobol Hawk. There will be packs for the approximate 5k run on the blue and white trails. There will also be a pack for those wishing to do just a 1 mile walk/run. The ‘race’ will start around 6:45ish pm -once everyone has arrived and is sorted. 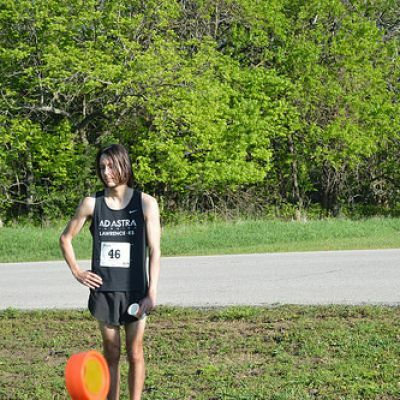 *We will have race waivers for non-Trail Hawks to sign before the run. 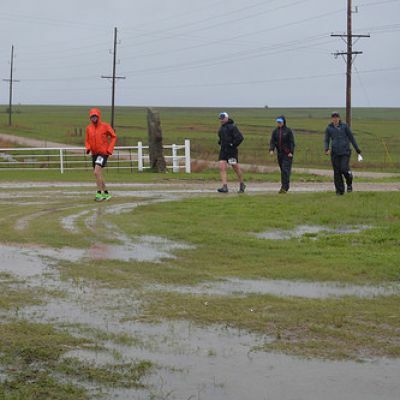 5k course – One pack will go out on white from Shelter 1 to where the blue and white trails combine (near West Park Road), back on blue to Saunders Mound, where they will howl at the moon, and then back to Shelter 1. The other “pack” will head out on blue to where the blue and white trails combine, back on white to Saunders Mound, where they will howl at the moon, then back to Shelter 1. The “pack” that wins the race gets a growler of beer! 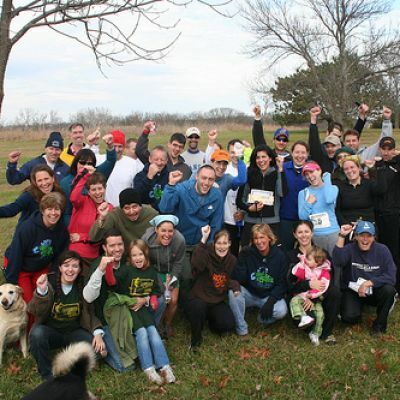 All of your pack needs to reach the end before being declared winner, this is a group fun run! There is an option to be a "lone wolf" for those looking to run fast by themselves. 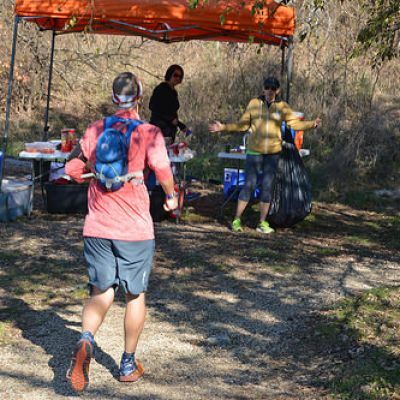 1 mile course will head out on blue to Saunders Mound, where they will howl at the moon, and back. 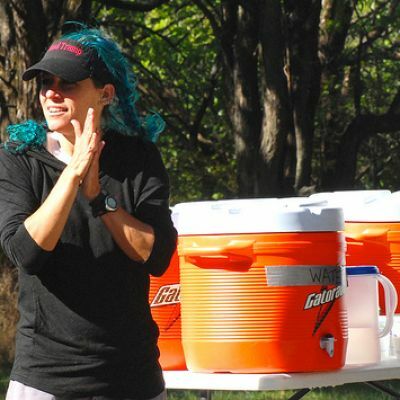 The Gathering: Before, after, and during the run, meet at the shelter for a potluck. The Trail Hawks will be providing a main dish of hamburgers and chili (vegetarian too), pop/soda/soda-pop and some treats. 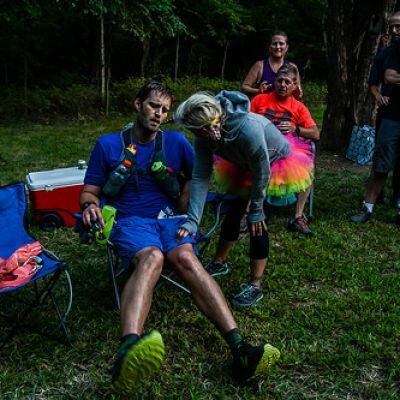 There will be some games, crafts, & award for best costume– voted on by your fellow runners! Important Info: Costumes are strongly encouraged!!! If running, keep that in mind when designing your costume. We’ll have some costume items that you are more than welcome to borrow at the shelter. 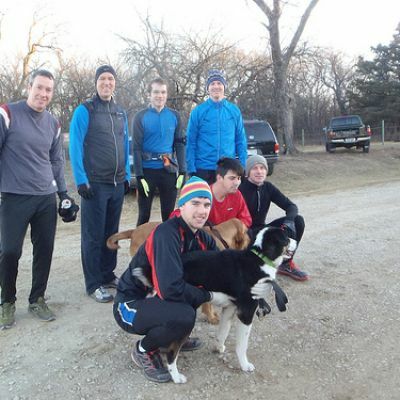 New Year's Eve Run, Dec. 31, 2011, George Latham Trails, Clinton Lake.